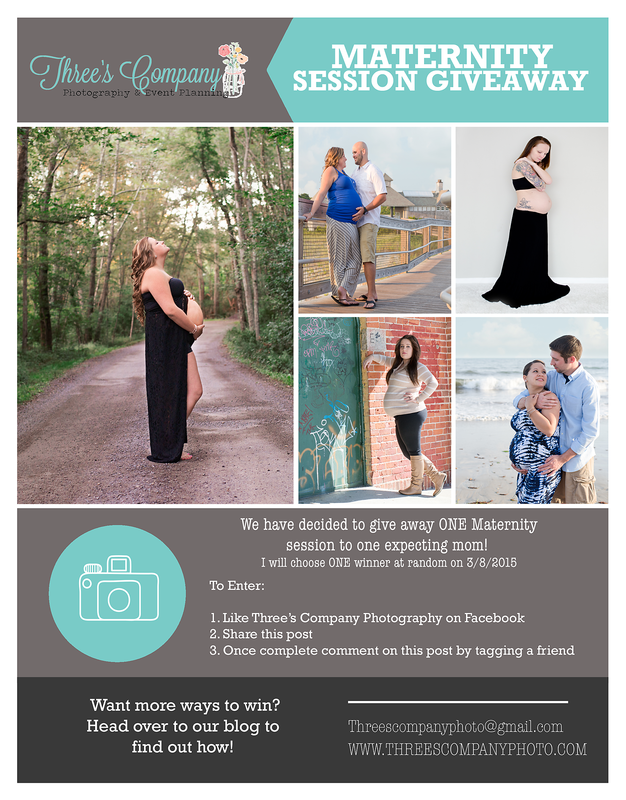 Today is the big day that we announce the lucky winner of our Maternity session giveaway! As stated in the video that was posted on Facebook on March 8th. I decided to announce the winner via video because I wanted to personally announce the winner! There were so many deserving families and if I could I would give out a free session to everyone I would!! I felt like doing a video would help put a face to a name to the individuals I have yet to have the pleasure of working with! One very important thing to think about when picking a photographer is making sure that you mesh well! There is nothing worse than having someone photograph you and your family that you just don’t mesh well with! I have been lucky enough to work with some incredible families over the years and look forward to photographing them for many years to come! Its a top priority of mine to really bond with my clients, make them feel like they have known me for years, share a few laughs and really have a great time! You should never dread getting your photographs taken and I know a lot of men really hate it (my husband being one of them lol….how ironic) Its my mission to make it as enjoyable as possible! I can honestly say I have been blessed with the BEST clients ever! I do my best to go above and beyond for each and everyone of you! Photography is my passion it is not just my business, I strive to provide a one of a kind experience to each and everyone of my clients! Thank you all so very much for being so supportive of my journey these past years! To all my upcoming and potential clients I look forward to working with you and photographing you and your family for many years to come! Now to announce our winner of our Maternity Session Giveaway Winner! It is posted in the videos section of Facebook! Thank you to all of the lovely expecting mama’s to be for entering! We had a great turn out and I look forward to hopefully working with some of you in the near future! Please keep an eye out for future giveaways being posted! So its right about that time where I do another Giveaway! I want this one to be huge! Lots and lots of entry’s! So the Giveaway I have decided on is a Maternity Session! With the weather the way it has been it is making me crave spring and summer and all things hot! (hehe some frozen humor for your disney movie watchers!) And although this session can absolutely be booked before spring and summer! I just felt like it was a great time to giveaway a session to a lovely expecting mama! This giveaway is going to require a little bit more effort from my wonderful followers! In order to Enter you must like Three’s Company Photography’s Facebook Page (linked below), You then must share MAIN Photo giveaway post on Facebook (please make sure its share publicly), Once complete please comment on the Giveaway photo by tagging a friend who you think would love to win this session! 3. Comment on post by tagging a friend/ family member. Doing all three of these will earn you 1 Entry! **Note: I will be verifying each and every entry so please make sure to do all of these steps in order to be entered to win! However there are more ways to earn additional entries! 1. Tag more people in the post! For each person you tag you will receive ONE additional entry. 3. Follow us on instagram, Share the giveaway post, and tag @threescompanyphoto will earn you TWO additional entry. READY! SET! GO! Giveaway begins NOW!